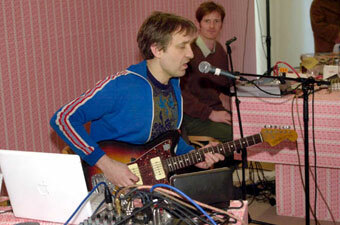 Sound artists Adam and Jonathan Bohman, Lukas Simonis and Anne La Berge formed the band APRICOT MY LADY in 2003. Since then they played some rare performances and recorded a lot of material. This CD 'Newly Refurbished and Tussock Moth' is only the top of that iceberg! The particular songs on this CD are chosen because they seem to form a sort of 'song cycle' with an implicit logic and all that. They are using found objects, text, voice, samples, filters, mixers, pedals, violins, guitars and flutes to make the music they make. It might be (un)interesting to know whether this music is supposed to be ‘improvised’ or ‘composed’ or ‘heavily processed’ or even ‘spontaneously erected’. It’s all that and less, or none of that and more. It’s a totally obsolete music (?) that sits on it’s desert island waiting for nobody, heard by everybody (maybe with a slight Friday on it’s mind, but surely not in earsight). The Bohman Brothers (Adam & Jonathan) are the creators of a unique and impure experimental music. Traces of Fluxus japery, musique concrete, sound poetry and free improvisation can be detected, yet ultimately the whole is greater and more arcane than the sum of it's parts. 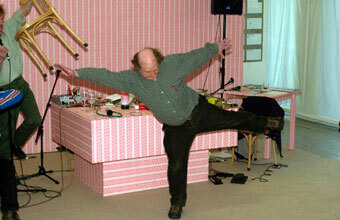 As a performing duo Adam and Jonathan Bohman have been operative since 1996(Adam Bohman is also a member of Morphogenesis and The London Improvisors Orchestra).Their sound art oscillates between states of the absurd and (sonically)grotesque to highly articulate explorations of extra-musical sound. One can hear various traces of out-noise lurking in the undergrowth of their 2002 debut album ` A Twist For All Pockets'. Lukas Simonis has been playing his version of rock & noise & improvised music for some time now. He cooperated ao. With Pierre Bastien, Goh Lee Kwang, Ivan Palacky, Dave Brown, Eugene Chadbourne and Peter Stampfel. Some of his bands; Coolhaven, Dull Schicksal, Liana Flu Winks, Vril, Faces. He makes sound & music for films, makes (& curates) radioplays and composes for various groups. He also works for WORM, a centre for experimental arts in Rotterdam. 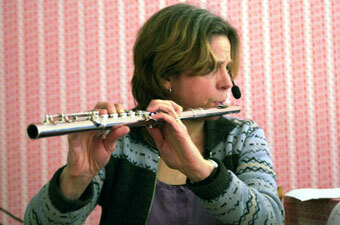 Anne La Berge is a pioneer flutist/composer, working her entire career with interactive computer systems, microtonality, improvisation and as a leading interpreter of contemporary chamber music. She creates and commissions artists to compose works with interactive/improvised music and video. The last few years have seen a new addition to her work: self-penned enigmatic short stories which slide seemlessly in and out of her compositions and improvisations.